The other day I took my bike on a long long bike ride to get to the sea through neighborhoods I never new existed. The idea was to get away from the city to breath fresh salty air and eat some newly caught clams. The bonus was that I got to pick ripe rose hips. The rose bushes where growing in the sand just at the edge of the beach. As a rose hip loving Swede, this was a happy moment and I picked as many as I could find. Rose hips are very high in vitamin C and there are plenty of things to make with it. For example, the outer fruity part of the rose hip (often orange or red) can be dried and used for soup and tea (which can be done with the fresh fruit as well). A rose hip soup is very popular in Sweden especially among children. I love it. The soup can be eaten warm or cold, with ice cream or tiny almond cookies (mandel biskvier) that are best soaked in the soup. My favorite is to serve the soup while cross-country skiing, smoking hot directly from a thermos. I can’t think of a better energy treat than that! If you ever have split open a rose hip you probably know that the hairy part that surrounds the seeds creates itchiness on your skin. Its annoying but totally harmless. (It’s actually used as an itching powder). Fresh rose hips are often used to make jam, marmalade or jelly. You can also make schnapps, liqueur or, why not some rose hip sherry? My sister Anna Kindvall has become sort of an expert at making sherry out of rose hips. So well that a restaurant recently wanted to put it on their dessert wine list. In her wine cabinet you can find different vintages of the wine and like many other wines this wine gets better with age. The wine is sweet and flavorful. It works well with desserts or different kinds of cheeses. It’s also great in cooking and, I agree with my sister, a dash of rose hip sherry in a chantarelle sauce is heavenly. My sister (and others) claims that the most flavorful rose hips are the once with long narrow fruits. I have also heard that the best time to pick them is after the 1st frost (however my sister picks them always before). Here in Brooklyn it’s still summer and the once I picked were all small and round (with a really nice aroma). I couldn’t get hold of winemakers yeast so I’m using instant yeast. Oh well, in time we will see how my batch of wine will turn out. Roughly trim the rose hips but don’t rinse them with water as the surface contains natural yeast that are useful in the process (or that’s what I’ve heard). Make a sugar syrup by heating up the sugar together with the water. When the sugar has dissolved let it cool. Use some of the liquid to dissolve the yeast. Let the yeast start (there will be bubbles on the surface) before mixing with the rest of the sugar liquid and the rose hips in a bucket or a glass carboy. Cover the jar and let the wine sit still for three months. At this time the liquid should look clear and the rose hips have fallen to the bottom of the jar. Tap the sherry into dark bottles (for example on 12 fl oz (33 cl) beer bottles). To avoid the sediment at the bottom Anna recommends spooning up the sherry instead of pouring (can be hard with a carboy). Seal with a suitable cork or cap. Let the sherry stand for at least one more month before drinking. If you are patient enough to store it, or at least with some of it, my sister thinks it’s best to drink after 5 years. My temporary landlord Russell Busch, who is also a good friend, just introduced me to kefir making. Kefir is a fermented milk drink that contains plenty of healthy probiotics. To make kefir from milk you need kefir grains which are a live and active culture of yeast and bacteria. Kefir is a very common drink in Eastern Europe and the Nordic countries. I grew up with it and if I remember correctly, the Swedish kefir is thicker, more sour and has a slightly carbonated feel to it. Swedes often eat kefir (with a spoon) together with muesli, cornflakes, fruit or just with sugar and cinnamon. I like my kefir best just plain with fresh fruit or berries. Others prefer making smoothies with frozen berries and fruits as it takes off some of the strong sour flavor. Luckily Kefir has become increasungly common here in the US. The kefir making process is super easy and you don’t really need to do much as the kefir grains do most of the work. note: no metal such as aluminum etc can be used as it will react with the kefir grains. Although, for some reason stainless steel seems to be OK.
Place the new kefir grains in a clean glass jar (about two tablespoons). Pour about 1 cup organic whole milk over the grains. Cover with the cheesecloth and fasten it with a rubber band to avoid flies (I actually just use a plastic lid that is just placed on top). Leave the jar on the counter in room temperature away from any sun. When the kefir has got thicker the kefir is probably done. It should smell pleasantly and have a mild sour taste. At this stage you will have a drinkable kefir. If it stays longer the kefir will start to separate the curdled milk from the whey. Don’t worry, the kefir is still fine, however it will be slightly thicker and have a richer taste. A longer fermentation will also create more probiotics and less lactose. The fermentation will take about 12-36 hours. When you think you are ready, give the jar a shake and drain it through the plastic strainer to separate the kefir from the grains. It’s important to be gentle with the grains so don’t press them too hard. The kefir grains don’t have to be totally clean from curds for the next batch. 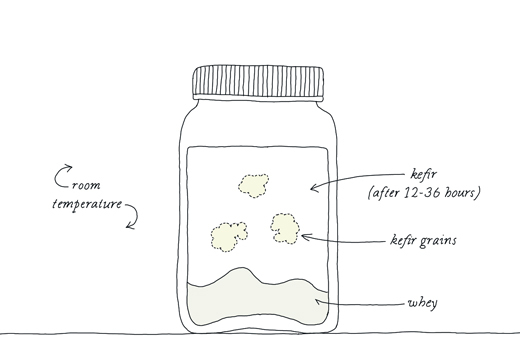 The ready-made kefir can be stored in the fridge, preferably in a glass container. It will keep fresh for awhile. If you think the kefir is too loose you can strain it to reduce some of the whey. Leftover whey can be used for many things (see below). 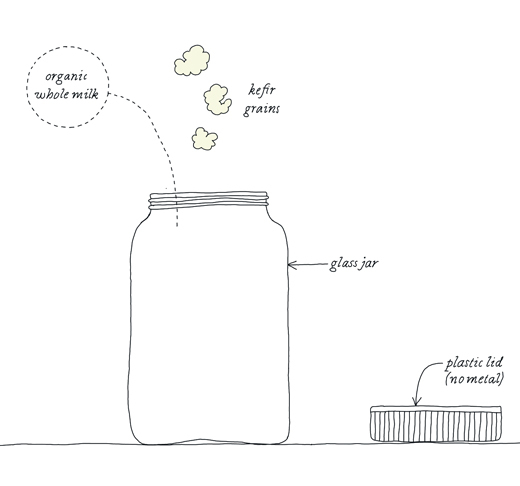 Prepare the next batch by placing the strained kefir grains into a clean glass jar. This time you should add a little more milk and the fermenting process will probably go faster as the grains have grown larger and become more active. The more kefir you make the bigger the grains will grow, you will therefore need to adjust the amount of milk depending on their size. At some point you need to split the grains up as there is a limit on how much kefir you can make. 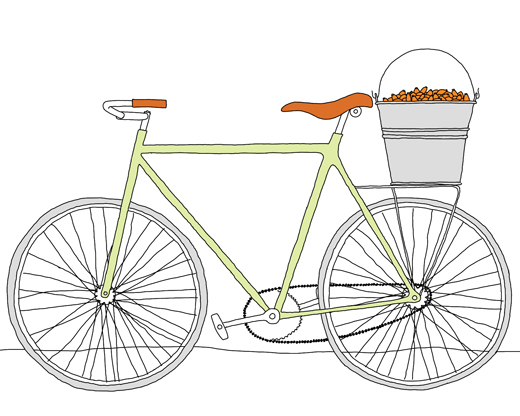 I suggest giving some grains to a friend or start making other things with it. You can, for example, make kefir drinks by using almond, soy or coconut milk instead of regular milk. In this kind of process the grains will not grow and therefore not last as long. I haven’t tried it yet but my landlord makes coconut kefir drinks daily. There are many other things you can do with the kefir if you don’t just want to drink or eat it. Kefir is excellent in dips, dressings, cakes and bread. It can also be used instead of yeast when baking bread or at least that’s what I’ve heard. Recently I made my own cream cheese or rather fresh cheese by straining the kefir from the whey through a clean kitchen towel or several layers of cheese cloth (takes about 24 hours). This creamy cheese can be served plain or flavored with fresh herbs, garlic or anything you like. Its also great to make pierogi leniwe (Polish lazy pierogi). You can do many things with the whey such as ferment vegetables, sauerkraut (cabbage) and when diluted 5 times with water it can be used as a fertilizer for your plants. For about a week I collected the leftover whey to make ricotta. I was amazed how well it worked out as the whey just looks like cloudy water. At some point you may want to have a break in your kefir making and it’s actually possible to store the kefir grains with some milk in your fridge. Just feed them with new fresh milk every now and again. When you start again the grains may not be as active as before the break, so you probably have to start again with just a small amount of milk. With or without snow there’s not much that’s as heart warming as glögg (Swedish traditional mulled wine). In wintertime, around Christmas, the rich smell is so welcoming its no wonder its such a successful way to treat your guests. Last winter I had to warn my guests that even though the wine was served hot it was not low on alcohol. They didn’t believe me, so I was happy they could all walk home safely after our joyful evening together. Like other Swedes I’m used to buying glögg already spiced at the Systembolaget, which is the one and only company that can sell liquor in Sweden. Systembolaget has an impressive selection of wine from all around the world and they have over 40 different kinds of glögg, both with and without alcohol. There is even a white glögg which is commonly served cold as an apertif at parties around Christmas. 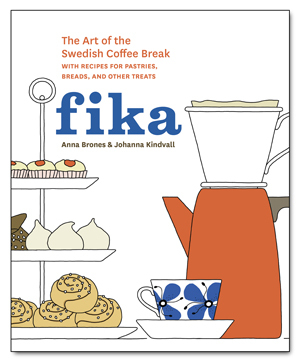 With a selection that great it’s hard to even think of making your own, unless you are a Swede like me living abroad. So I started, and today I can’t ever imagine going back. At Christmas I want my own glögg. And the glögg has to be done with some drama by caramelizing the sugar. Heat up the wine but be careful, the wine should not boil. Drop all the spices into the warm wine, turn the heat off and let rest covered for at least 4 hours (best overnight). Sieve the spices from the wine and heat it up in a saucepan. Again make sure it doesn’t boil. In the meantime prepare a stainless strainer filled with the sugar. When the wine starts to get hot, place the strainer over the saucepan. 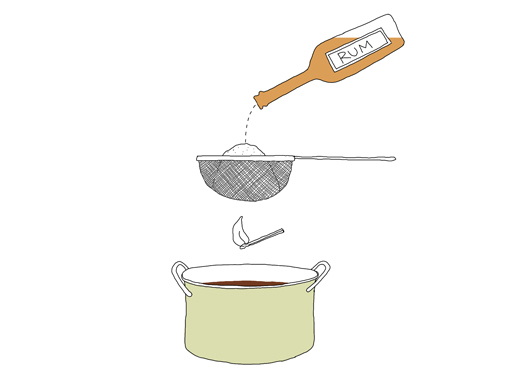 Pour the rum over the sugar and light the alcohol steam below. 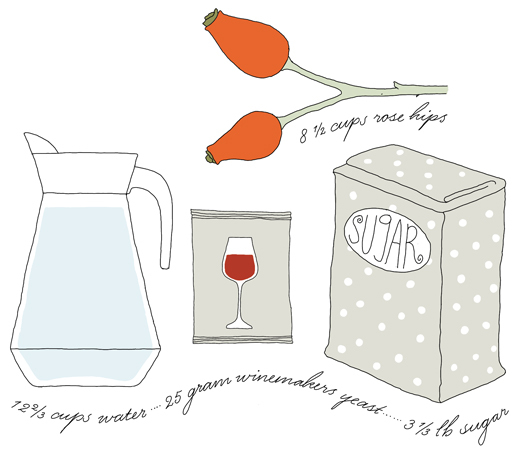 Let some of the sugar drip into the wine mixture before adding all to the wine (if you wait for all the sugar to melt the alcohol will disappear with the flames). Take the saucepan from the heat and cover with a lid to stop the flames. 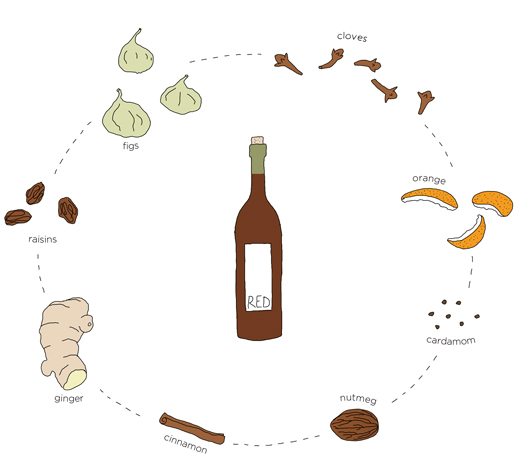 If you think the glögg is too sweet you may add some more wine or rum. Serve the glögg in small cups together with some blanched almonds and raisins in every glass. Glögg is also great with gingerbread cookies. Story and recipe was originally posted at EcoSalon on 21st December 2011. A couple of years ago I visited Cologne for a few days and my biggest impression of the city was how alien the dome looked like. The church is like a huge mother ship that landed in the middle of the city. This kind of huge contrast in architecture is something I enjoy very much! Another memorable moment was when, after a long walk, my husband and I sat down at an outdoor pub where we immediately were served beer in tiny glasses. As the beer was delicious we kept drinking accompanied with herring. Until recently I had no idea I was drinking Kölsch. Kölsch is a warm fermented beer that is a specialty of Cologne. 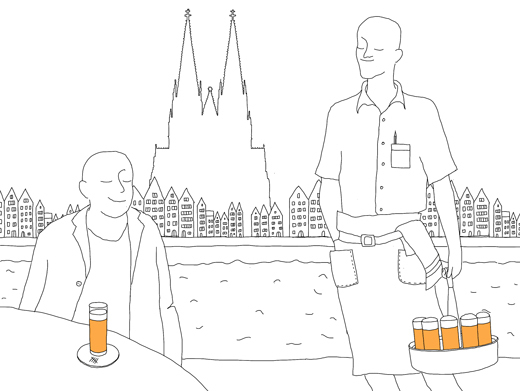 Read Steen Hanssen‘s article about Kölsch (illustrated by me) over at Honest Cooking and learn much more about this big beer that is best served in small glasses. (This is my second job together with Steen, see also White Asparagus). At the end of June or the beginning of July is when St John’s wort starts to bloom. In Sweden, the plant is both common as a perennial in gardens and wild in the woods. I find them every year next to my house on the edge of our gravel road. 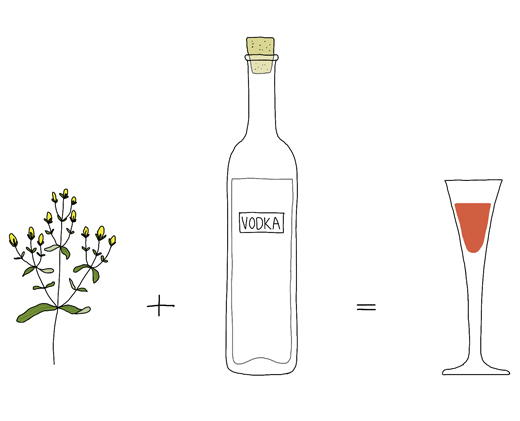 I pick the flower or rather the buds to soak in vodka. In Sweden we call the spirit Hirkum Pirkum which comes from the Latin name of the plant, Hypericum perforatum. As I’ve said before, St John’s wort is supposed to heal angst and depression. In the old days it was used to drive spirits away. You just needed to hang some twigs of the herb over an image of the ghost or even the devil and that specific spirit would leave you alone. For the snaps essence: Pick about two tablespoons of St John’s wort buds (skip the flowers that are in full bloom). Rinse and clean them if neccessary. Put the flowers in a jar or a bottle. Cover with 200 ml vodka and soak for about 8 hours. Strain and add some more vodka if you like (I added about 200 ml). The result is a pink and pretty delicious snaps! (You can soak it longer if you want a sharper taste). 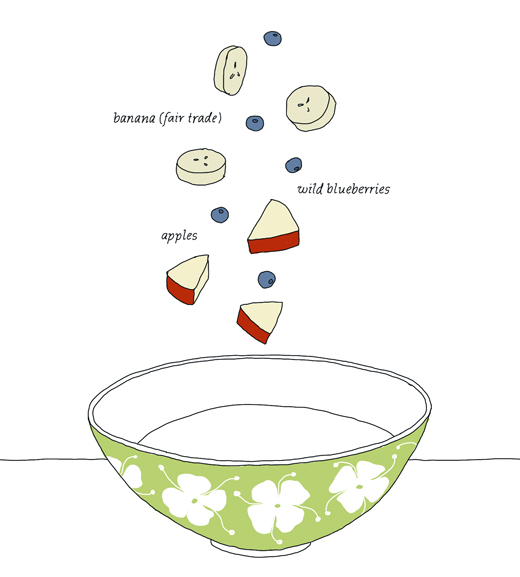 This recipe was first published in Honest Cooking, 4 July 2011.